A workshop space for small groups that are open to exploring ways of changing a view of their world. Tucked away in the woods on 2 acres, Steve and Shelley Mayse facilitate creative events in their home/studio that are varied and life changing. Some of the possible workshop subjects are: the painting discovery, print making, collage, the shrine, assemblage, the letter project, SoulCollage, sand tray, figure drawing, design-your-own and others. (no previous art experience needed). tranquil private retreat. the home was designed and built by the couple in ‘89 and the studio was added on by the artist in ’08. Steve Mayse, a professor of art and design for over 30 years at the Kansas City Art Institute and the Charlie Sosland chair in Illustration, has been a practicing artist and illustrator for over 40 years with an m.f.a. in design from Kansas University. His work has been exhibited in many magazines across the nation, in galleries in Kansas City and the midwest, N.Y.C, L.A. and S.F., Ca., Australia, the Czech Republic and recently did work in Buenos Aires, Argentina. Shelley Mayse is a licensed specialist clinical social worker with over 20 years experience. she has an m.s.w. from Kansas University, is a trained life coach and a conference presenter on creativity and wellness. She enjoys working with clients to foster personal/professional growth and believes in the power of the creative process to enhance and achieve life's purpose. We are available to discuss planning options or will share previous workshop syllabi or photos. We look forward to sharing ideas that support creative growth. A workshop opportunity for small groups that are open to exploring ways of changing a view of their world. 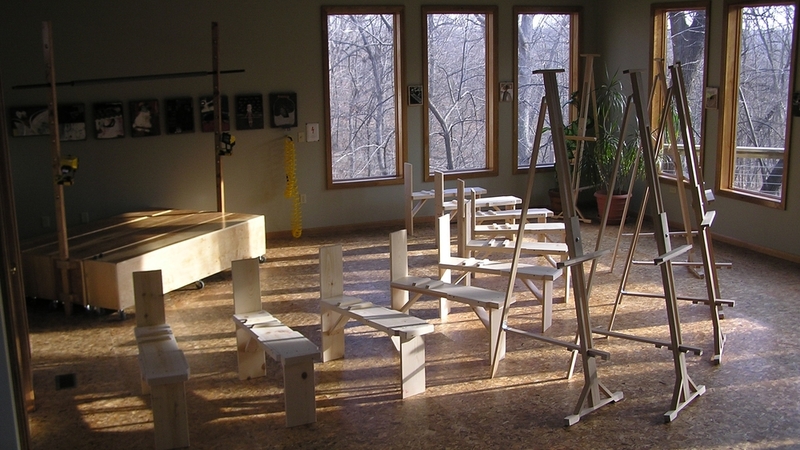 The workshop space: an artist’s studio space converted for group use, measuring 25’x33’, ample room for up to 18+ people to function well within the space. The setting is located on a 2-acre peaceful wooded property with outside elevated decks for creative contemplation.